Listening now Docter too the new show. I am so happy to see the movies reviewed. I put off my buying prowess to hear what everyone thought of the new blue rays. Hopefully they come in good cause I am itching for some good horror blue rays. The good news is, you'll find a few entertaining movies among those discussed in this show, ones that are certainly worth picking up. If you do buy them based on our recommendations, please be sure to come back after you watch them, and let us know what you thought. I love the films of the 30's as well, and could probably dedicate my segment to them in it's entirety from here on out. However, I do have a pretty lengthy list of horror films from the 40's through to the late 60's that I really want to get to as well. As I said in the show, it's only a temporary "goodbye" to the 30's...I'll be back there at some point down the road! Thanks again for stopping by the site, and for listening to Planet Macabre. The guest was a real asset this week. Also liked the change of pace to the new horror movies on this show. Let Bill Chetie know he did well. I was really curious on the remake of I spit on your grave, nice discussion. I will be picking up the Traveler based on yours and Bill Cheties rating. One final thing, you never did rate the Raven from 1 to 10, what would you give it? John: Thanks so much for stopping by, and for the comment. I'm glad you enjoyed the episode, and I agree with you on Paul; he did a great job filling in for Lady Phantom. I'll pass your comments on to Billchete (and yes, it was a very good selection of films). The I SPIT ON YOUR GRAVE remake is one to check out, and I did enjoy THE TRAVELER (while I didn't rank it as a 'buy', I did find it a well-made film with only 1 or 2 minor issues). It's funny you mention the rating from 1-10 for my pick. I noticed that the other hosts do assign a rating to the picks made in their individual segments, but I personally didn't see any point in it, seeing as it was a movie I was recommending anyway. That said, I suppose I really should try to keep things on an even grounding, so going forward, I will start to assign ratings to my classic picks. 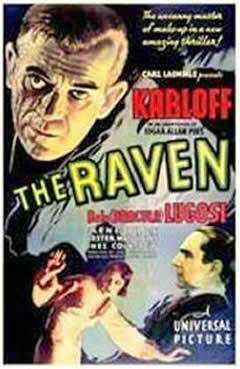 My rating on THE RAVEN would be 8.5 (the dance scene kept it from a 9), and I would recommend a 'buy' for it. Thanks again, John, for the comment, and thanks for listening to Planet Macabre. That was a quick reply, thank you so much and for the rating of 8.5. I didn't mean to imply for you to change your segment, was just curious on this one how high you would rate it. I see the "buy" link here on your blog is a collection as you mentioned on the podcast. Planet Macabre has a "buy" link overseas and while I do have a region-free DVD player I would rather purchase it from the U.S. Do you happen to have another link for just the movie? John: Not to worry: I've been contemplating if I should add a rating to my segment, especially since the other hosts are doing so. Hearing from fans like yourself only makes the decision to change an easy one. I thank you for the question. I've just done a search on Amazon, and the only copy I could come up with for THE RAVEN other than the Lugosi collection is a VHS copy of the film. While I can attest to the fact that the Lugosi Collection is a great set to own, I do understand that it's over-$20 price tag can make the decision to purchase it a difficult one. I even tried to check and see if the film is available to watch on YouTube (sometimes, these older films can be watched in their entirety on that site), but it looks as if it's not available there, either. Sorry I couldn't be of more help. Going forward, I'll have to take availability into account when selecting my classic recommendations (but trust me, THE RAVEN is a good one!). you guys make my work day go by so quick! i listened twice to the latest podcast so I wouldnt miss any recomendations. Thanks also for listening to Planet Macabre...I'm glad we could do our part to make work go quickly for you! We certainly appreciate the kind words (and thanks for listening twice!). I Sincerely ADMIRE all of the hosts on Planet Macabre. The level of clarity on the summaries and discussions are excellent while giving the audience a guideline on what is worth a purchasing, rental, stream or avoidance. I hope your podcast is around a long time, I don't know where I would turn for my horror movies without it. Golan: Thanks for stopping by, and for the comment. I certainly appreciate the kind words, as I'm sure all the hosts do. We're now 7 episodes into Planet Macabre's run, and the response has been tremendous. It really makes all the work put into the show worthwhile to know there are fans such as yourself out there. Thanks so much for listening (and like you, I hope Planet Macabre is around for a long, long time. I know I'll be there if it is!). Roberta: Thanks for stopping by! I'm glad you enjoy the Chills of Yesteryear segment (and you're long wait for the next "Paranormal Playground" may be coming to an end...Lady Phantom is due back next show!). first time visit from the planet cast on horror movies. been wanting to check out the website here for some time now, finally remembered. i hope this reaches dr shock tell him i like the classic horror movies. Addison: Thanks so much for stopping by, and for the comment. This is Dr. Shock, and I'm glad you enjoy the horror classics I've been selecting. Hopefully, I'll be able to keep that streak alive on future shows. Another B&W horror classic I forgot about Shock. Keep the nostalgia feel of the classics going strong! I'll do my best to keep them coming, and I appreciate the kind words. this one should get a colorized version mister shock: i know they do this for some movies wonder if any of these old horror movies come around to colorization. a bunch more dvd's to buy from episode 7 the new hodge podge pod cast. great stuff. Personally, I'm not a fan of colorization...I prefer that movies remain in their original scheme. Especially when it comes to these old Universal horror films, i feel the black and white really adds to the overall atmosphere. That said, if colorization will gain an audience that otherwise would have never bothered with the film, then I suppose it serves a purpose. I'm glad you enjoyed the episode, and I agree...there were some fine films discussed. I hope you enjoy them, and when you do get a chance to see them, please stop back to let us know what you think. Excellent episode and pick Sir Doctor. I'm glad you enjoyed the episode, and my pick for this show's Chills of Yesteryear segment. Thanks so much for listening, and for the kind words. BRAVO Dr.Shock nuther excellent episode and excellent DVD pick - Give me more HEHE! Thanks so much for the comment, and for stopping by. I'm glad you enjoyed the pick, and the episode of Planet Macabre. Just as an FYI, our next show is shaping up to be a good one (and I'll do my best to pick another great classic as well). Thanks again for stopping by the blog, and for listening to Planet Macabre. anuther hit doctor your 7 out of 7 so far on the oldtime horror - keep it up!! I'm glad you enjoyed my classic pick for this episode (and I really appreciate that you think I'm 7 for 7!). Hopefully, I can continue that streak with next week's classic pick! Universal horror is great for the most part, that price is sickening though. With the decline in the economy you think these companies would put out some deals. 20 dollars for a movie this old is just nuts. I am a DVD collector currently have over 5,000 plastic discs and I wouldn't pay 20 for a new release. Too bad because this one I wanted, your summary on the podcast convinced me, I hate the "sets" on one disc, ruins it for me. If you ever come across a better price Dr. Shock please announce it on the podcast if you would. I don't get time to visit websites too often. I agree with you on both counts: Universal horror is great, and the price for the Bela Lugosi set is WAAAYYY high! You're like me in that I own thousands of DVDs, but that number would be MUCH lower if I had to pay $20 for each of them. I myself didn't buy this set until I saw a good price for a used copy on Amazon's Marketplace (on a side note, some people don't like to buy used DVDs, but if the seller is reliable, then it really is a great way to save some money. My personal rule of thumb is: if the Amazon seller has a rating of 96% or better, and there are at LEAST 5,000 reviews for them, then you're in good hands.). I'll keep an eye out for a low-priced copy of this set, and will certainly bring it up on Planet Macabre should I come across any. Good episode again Dr. Shock. I am with the one commentor above about colorization, wouldn't mind seeing it on some of these classic horror movies. I'm glad you enjoyed the episode. As for colorization, I have a personal preference for the original black and white, but like I said above, if it can expose a new generation to these films, then why not? Gervase: Thanks so much for the comment. @Yosef: Thanks for the comment, and for stopping by the site, and I'm glad you enjoyed THE RAVEN and BLOOD FEAST.